Published September 9, 2011 By Anna T. This post may contain affiliate links. Regardless, I only recommend sites I've researched and/or used and trust. This post is going to be a brief rundown of World Travel Holdings — a company that hires customer service representatives to work from home taking calls. I believe this company is currently accepting applications. The company has been around for over 25 years. What does a customer service rep do for World Travel Holdings? Customer care reps get $10 to $12 an hour depending on your specific position. You are additionally hired as an employee — not an independent contractor. This means you are eligible for lots of benefits, including 401K, health benefits, and some paid time off. You will be trained for six weeks before you start working, and training is completely paid. Payments are made every two weeks. 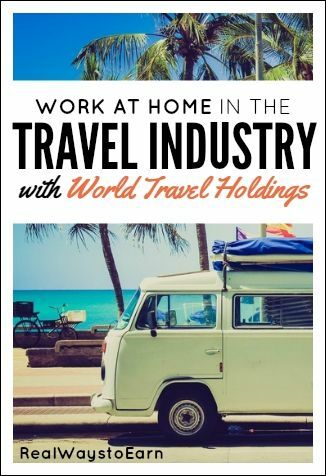 World Travel Holdings needs you to work full time. They do not have part time positions available. This means 35-45 hours per week, and your schedule is determined by World Travel Holdings. You might also have to work on weekends and holidays. If you have a preferred schedule in mind, they will try to accommodate you if it all possible, but it isn't always possible. This is the part I thought was strange. Most companies just tell you what you need to do the job, but World Travel Holdings actually ships you a computer, monitor, keyboard, mouse, phone, and headset if you are hired. Anyway, at first I thought it was fantastic that they ship you a computer — until I found out that you are expected to pay for it! Apparently the cost of the computer is about $500 and they deduct $100 out of your first five paychecks until it is paid for. But the company claims you get the $500 refunded to you after you quit or get fired and ship the computer back to them. So … you'll just have to decide on your own about that, if you are comfortable with this arrangement. Is all the training done at home. I have almost 4 yrs off cruise line training as I work four Celebrity Cruises. I loved the business and I hope to continue to work in it. And working from home well be great. The reason why is because the people who train you are Travel Pros they are not just trainers they have never gone to school to teach they are just travel pros, this one girl brags about how she has all the sonority with the company. She also bragged how they had given her niece a free cruise ,each training class wins a free cruise but she stated that her niece won it in the last class i felt that was very unprofessional of her. one girl in the class called them out because her answers changed when she finished her test but it was true others posted comments about as well and then just laughed at her and i wanted to say something but just kept my mouth shut . Would someone please distinctly separate and describe the differences between Customer Service Red and Travel Pro? It’s difficult to tell what exact info applies to each job. Thanx. Do they have multiple shifts? Yes. There are a variety of shift available. I got exactly what I wanted, which was nights due to school. I get paid a shift differential and currently make $12 an hour. Hey. Are you still working there? Do you like it? What is your night schedule like? Please answer if you see this JGW….thanks. Yes they taught us all of the cruising promotions. Not really much upselling, pretty much just offer the travel protection on every booking that you do. The Travel Pros have a much harder job in my opinion as they work off commission only. I’m on the phones and not having any issues. Hope this helps. Do they teach you how to promote and upsell? I am currently ending week one of training for Customer Care Representative. We are being paid $8.00 an hour until 4 weeks of training and then it goes up. Do you have to have a minimum of typing 55 WPM ? I can’t seem to get mine past 40 WPM ? What is the difference in job tiles Vacation Pro VS Customer care ? I have my first interview this week is the second one a face to face in there office ? Travel Pro is a dedicated sales position. You have an extension so that new and returning customers can contact you directly. It is a commission-based position. Customer Care deals with customer concerns/complaints, although I’ve read that they are “encouraged” to turn these callers into bookings as well. My interviews were both over the phone as I’m working virtually from home. How is the training going and what do you think so far ? Three days left! Things are coming together. The only problem is that we don’t have our set schedule for the next 12 weeks. This is quite a problem because I need to plan for getting my children to their activities and I need to know what days off I will have. They are transitioning to a new shift bidding system and that’s caused the delay. Thank you for coming back to me. I start on Nov 10th. I wish you the best! Wow 6 weeks went by pretty quick. I wonder what a shift bidding system is ? Do you know how that works? I just recently applied and I have my second interview this Thursday. Training is all virtual. Starting pay is $11.00 and in 6 months you get .50 raise and in 18 months another raise. You do earn commissions/incentives. I have read mixed reviews but I am 100% comfortable going into this at this point. Training begins October 3rd. I just finished my 3rd week of training and we are receiving $10/hr (10-am-7pm M-F). After training and a trial period, it is $8.00/hr or your commissions, whichever is higher. I’ve discovered that 1. They tell you that you don’t need a prior travel background. It sure helps in training when taking those first calls. 2. When you first get on the phones you need a trainer to listen to a very long recap you must read verbatim (with good reason). The trainers are also there to help everyone with promotions (very confusing) and basically maneuvering through various booking tools. However, the “Rock Stars” keep trainers busy listening to recaps (i.e., booking a cruise) and the poor soul that just needs help is left to flounder with a customer that has been on the phone for 35 min. Thank you for clarification. I was wondering what the pay ACTUALLY was because I have read several variations. I’m still in training but from what I’ve read, b/c it hasn’t been discussed in the first 3 weeks of training, is that it is $8/hr or commissions, whichever is higher. Is the pay $11.00 plus commission or a flat rate of $11.00? Is it true if you don’t make a certain number of sales you get terminated? Isn’t that true at any job? You have to bring something to the table or your not making a difference but you have to really be bad at incoming calls to be fired.You get 6 weeks training which is more than enough.But there’s a lot of turn over but that’s at any call center,it’s usaully the persons fault that they get fired,you get a lot of warnings before you get the boot!! This is a legit company, I’ve worked for them for years. You pay $500 for the computer and they give it back if something happens and you leave or fired. And of course there’s incentives for performance and advancement in the company. Training can be done at home most likely. There’s a Virginia Beach location and Orlando location. Love working for them and I work from home!! What is the cost to ship the computer back to them if you leave or are fired? Is the computer worth keeping since you paid for it or is it all a business based computer only? What are the different work shifts they offer? is it possible to apply from outside the US for this??? Training is done from home and the $500 is returned with no hassles fairly quick after you return the equipment. They also supply the phone and headset! They supply the computer because it will be loaded with their propriertary software and the $500 is NOT to purchase the computer rather it is more like a deposit. I believe the raises were like .25 cents at a time but can’t remember if that was evrery 6 months or a year so starting at 11.00 an hour you do not just jump to 12.00 an hour! Great bunch of people to work with but they will push you to make sales even if you are CS and the schedules are very inflexible. As a new hire expect to get hit working most holidays and weekends as scheduling, at least when I was there. was based on seniority with a little favortism to boot. I would still recommend them as they are one of the better paying at home companies and the job is fun! It is NOT great for families with kids that do activities, especially if you are a travel pro. Travel pros hours are between 7am-1am and you are scheduled for 9 hrs with a 1-hr lunch. Do the figuring out of hours. If you get the 7-4 shift the first 2 hours are pretty much quiet … 2 hours of lost sales, which affect your metrics and stats leaving you to pick from the worst schedules. Also, NOBODY gets Sat/Sun off, even if you’ve been with the company for 20 yrs. Just trying to get some info on this WAH company. Associate support. And average of closing a contract. Requiring to work 40 hrs per week. Do they set your schedule? What are the usual hours of the day they require? What type of support is given. Does anybody know if the pay ever increases with performance ? I am not sure on this, but I think that I did read there are opportunities for advancement within the company. There are pay raises every six months up to 12.00 or 12.50. I just got on with them and am the original poster in the forum highlighted above. Thanks for the additional info, Tina! can you tell me a little more about training? I would love something like this if I had more control over the schedule. I’m afraid I’ve gotten too used to working for myself, at this point. I have looked at this company a few different times over the last few years. I have heard great things about it and most seam to not mind the PC issue because the PC was better than the one they already had or they liked the idea of having a dedicated work PC. I worked for Alpine, West and Live Ops in the past and they have good and bad things about them. I have always wanted to work with travel, something to add to my VA side of business, and this company is one of the few that make you an employee rather than an IC/Host situation. What I liked best is that they have different levels of positions you can apply for. I think this company is a place a lot of people can benefit from. Thanks for the insight, Chrystal! I actually almost did not post about them here because you had to buy the computer, but then when I kept reading I learned that they’re actually a good, reputable company that a lot of people really want to get on with. And buying the computer I guess is not that big of a deal since they are willing to reimburse you for it. What do you mean by different levels of positions? Such as? This sounds like such a great opportunity. I wish more places would had available part-time positions because not everyone can work a full-time schedule. Excellent post, I didn’t know about this company before! So you can apply for part time only? Do you know what part time hours are given? Well, if nothing else I really like their logo. lol When you get into full-time, employee positions in the work at home world, it seems that people are either going to flock to them or throw them by the wayside. They certainly make things difficult for those that are staying at home to be with their little ones.